When buying a car in Mississippi, you must obtain certain required paperwork from the seller in order to register and title your vehicle. If you buy your car from a dealer, they will normally process the required paperwork on your behalf. However, if you buy the car from a private seller, you will need to visit the Mississippi Department of Revenue (DOR) to register and title the car in your name. Continue reading this article to get more information about the paperwork required when buying a car in Mississippi. The vehicle title which must include the vehicle purchase price. However, if there is no place on the title to include the purchase price, obtain a bill of sale from the seller. You will also need an odometer disclosure statement. To transfer a title in Mississippi, make sure it is properly filled and signed by the seller. You and the seller must sign and include printed names on the title. The title must have a purchase price on it. If there is no space in the title, you must obtain a bill of sale. To apply for a new title or transfer the existing title, you have to pay $9 fee and additional $1 service fee. It is not recommended to purchase a vehicle without a title. If the title is missing, damaged or lost, ask the seller to apply for a duplicate copy and sign it over to you. A properly filled certificate of title. To pay $14 registration fee and applicable taxes (vary based on county of residence and purchase price). NOTE: Your newly purchased car must be registered in the county where you will park the car overnight. 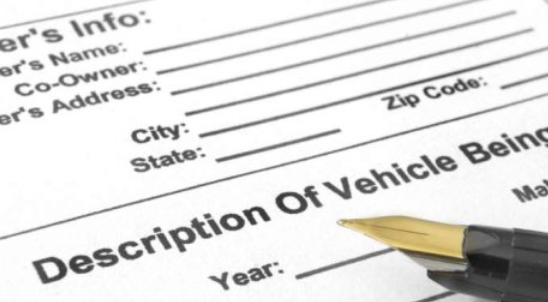 A Vehicle History Report is not needed when registering or titling the car. However, this report is needed to verify and confirm the status and history of the car you are purchasing. By requesting a vehicle history report, you will not only avoid car problems, but also avoid a number of vehicle frauds. Make sure you have this document at hand when negotiating with the seller. Mississippi State has a lemon law that covers vehicles used to transport goods and people. This law covers vehicles for 12 months from the date of delivery from the seller or during the warranty period. If you think you have bought a lemon, you need to notify the seller immediately to request a refund or vehicle replacement.